Anyways....... I am in a swap that we have to make a set of cards each month next year. 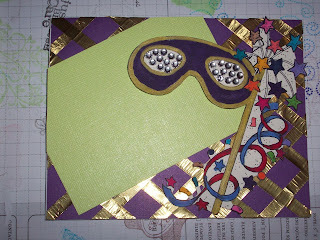 The theme for February is Mardi Gras. And let me tell you this is no easy task! I had this great idea of using diamonds in the background.... but the stamp I had was way to small the mask covered it. So I start digging and I found this great gold foil tape. So I decided to "create" diamonds on the card. While it looks more like lattice to me it still has the effect I wanted. I am totally in love with this stamp! Looks very festive! Great job...I love when I dig and find something I had forgot abou, makes it even more fun. This is just delightful and i love the diamonds... so pretty!!! Oh -- I LOVE this so much!!!! What a wonderful Mardi Gras card!! This really does remind me of New Orleans! Great job! Pretty card. I love those colors! Wow! Great job on this! I would find making a Mardi Gras card difficult too, but you really did a nice job! Those turned out great Lin! You did a great job!! The card turned out so pretty! I love those colors! Very cool! Love the diamonds and the background! Love all the colors also, very Mardi Gras! That is a great card. I like the foil technique. awesome card - it is just so vibrant and lovely! love all the diamonds - diamonds are a girls best friend!!! wishing you a most joyful and wonderful 2009!!!! Great card. I never make anything for Mardi Gras but I should. I love the brighteness and the funness (I know, not a word, but I like it, lol) of the celebration. How cool! Totally looks like mardi gras! Great card - love the colors. That's a great Mardi Gras card! Very festive! None of your pics are coming up for me, they are all X'd out??? I will check back later and see if I can see them. I would never have come up with anything for the Mardi Gras theme! You rock! This is bold and colorful, and neat job with the gold foil! I love you card lin! the eye mas is great! Lin, Hi I am back. I hope you are not to cold. BBRRRrr. 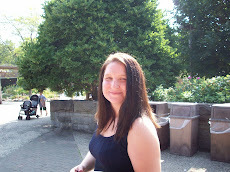 Also, I have an award for you on my blog, check it out when you have time. Come back to blogland, Lin! 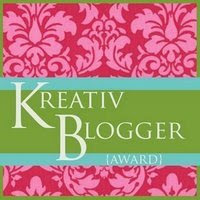 I have an award waiting for you on my blog if you do!! Great card! I love the snowflakes! cute card, Lin! I love what you did with the foiled background! This is looking so nice. How much time was taken on designing this card? The different designs takes different times. Designing through computer don't take much time but designing by hand takes much time. I am so inspire from this card.